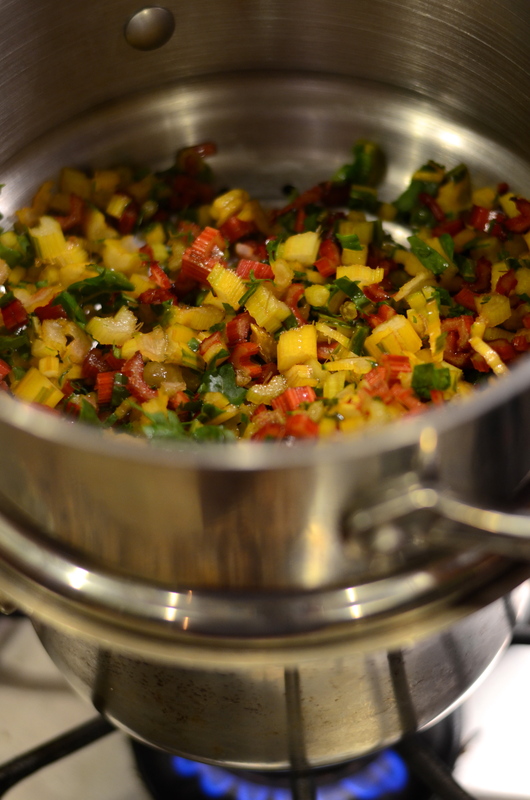 I made a cooked vegetable dish this weekend that I fully intended to share on the blog. It displayed a medley of farm-sourced ingredients and required quite a bit of time to stir and cook. When it finally finished, I sat down and ate it…and didn’t like the flavor. One of the vegetables I incorporated was kohlrabi, and I think it was too dominant in the dish. More importantly, the vegetables were supposed to soften after pan frying for so long, and the kohlrabi didn’t. It stood out. It may have even been burnt–I couldn’t tell. The dish was edible, but it needed a lot of tweaking before sharing. Fortunately, it wasn’t served to guests–only to my husband, who years ago would have run away if I tried serving him a dish with kohlrabi. He didn’t love it either, but he ate it. I’m so proud of how far he has come. It got me thinking about the people, young and old, who won’t eat vegetables, and their noble partners who, out of concern for the health and well-being of loved ones, find ways of sneaking in nutrition. Do you know one of those people? Maybe YOU are a sneaker. 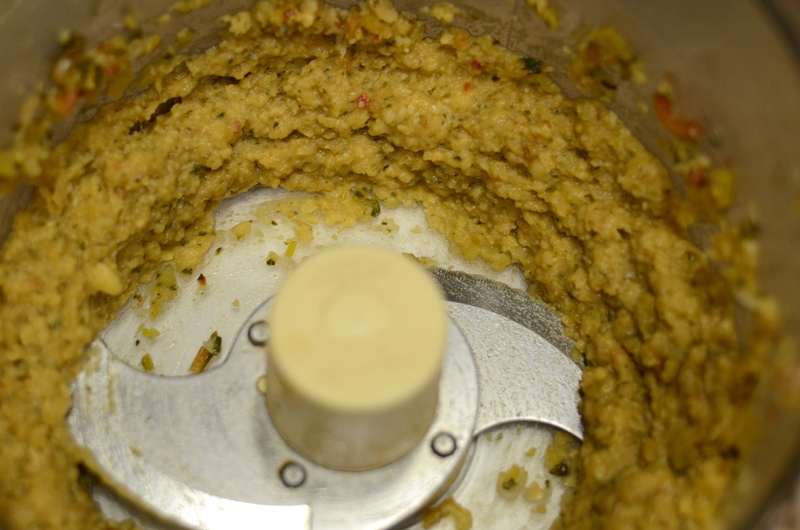 You probably use up even more of the vegetables you buy than I do, because you plan to throw them into a food processor to make a secret sauce, or soup, or dressing. 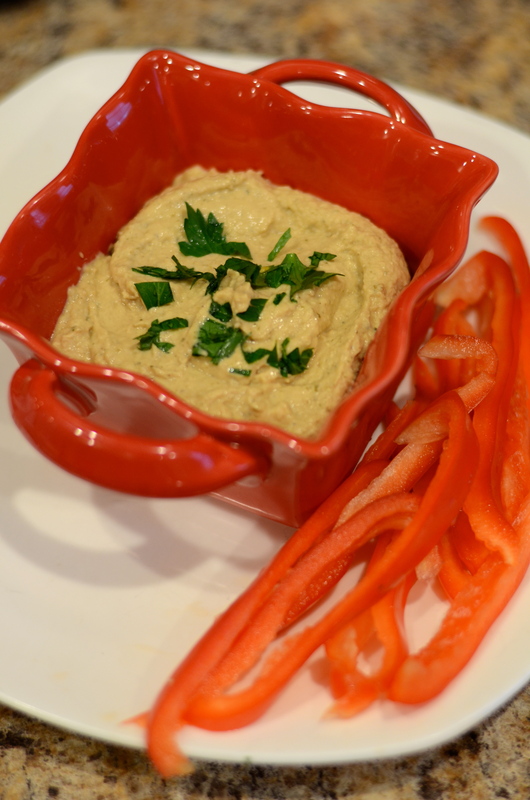 In my ongoing search for recipes that use the Swiss chard stems, I found this recipe for a chickpea, tahini, and yogurt dip with hidden Swiss chard stalks. Last summer I pickled some stems, which was great for preserving, but I rarely reached for them in the fridge. When I tried this grilled Swiss chard stem recipe, I didn’t seem to have enough stems to make it substantial…and then some of them even blew off of the grill while they were being cooked! 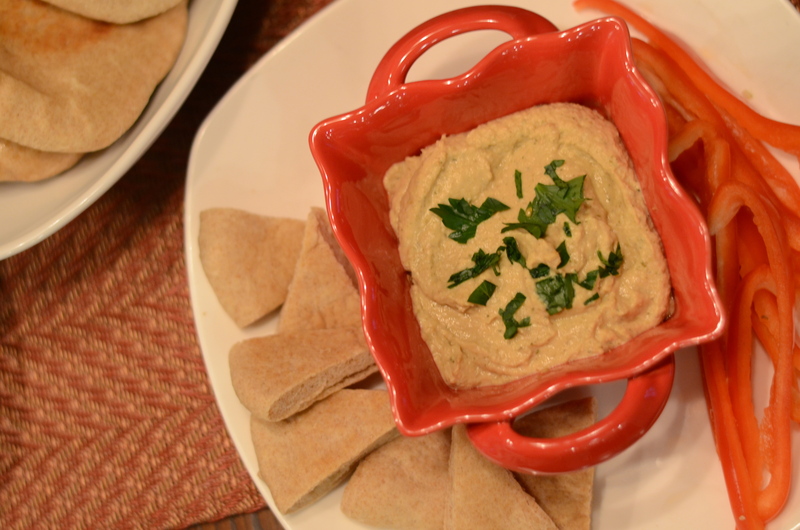 When tasting the hummus recipe I made this Monday, one would never guess it has Swiss chard. What a difference from that weekend vegetable medley! Are there those with the opposite view of a stealthy vegetable cook, who insist that each vegetable be featured prominently and celebrated, who are less than impressed with this approach? Perhaps. But this dip is undeniably delicious, and I do give the Swiss chard stems some of the credit. 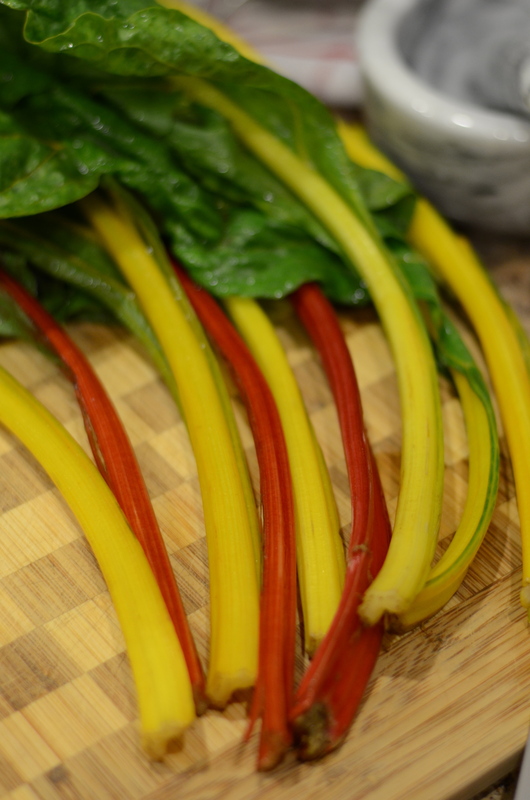 Steam chard stalks over 1 inch water until tender when pierced with a fork, 15 to 20 minutes. Collect the rest of your ingredients. Drain the Swiss chard stems well, about 10 minutes. 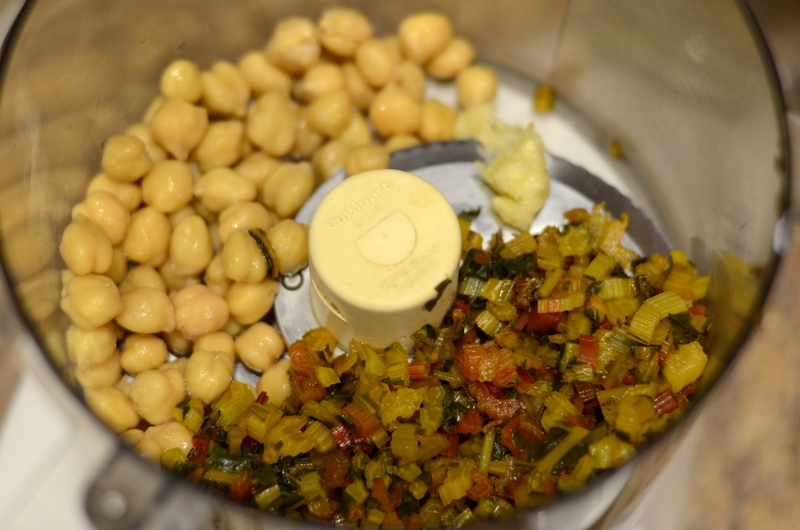 Add to a food processor along with your chickpeas. Purée, stopping the machine from time to time to scrape down the sides. 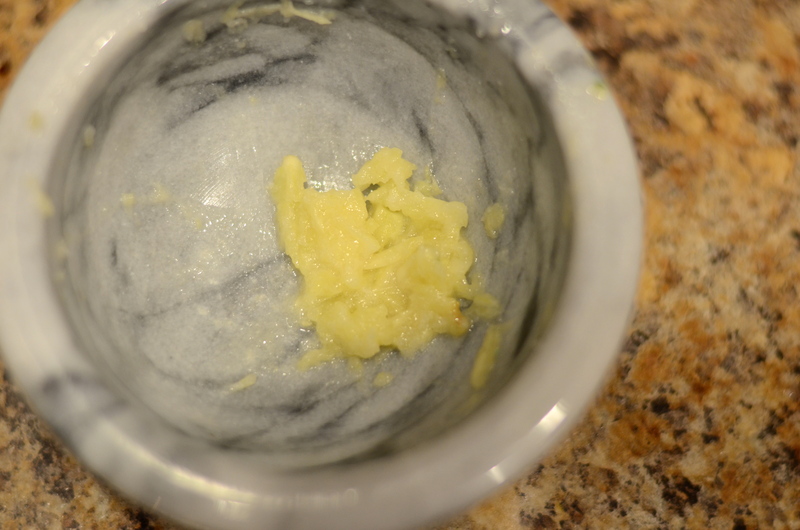 Using a mortar and pestle, mash garlic with 1/2 teaspoon salt until you have a smooth paste. Add to chard stalks and chickpeas. Process until smooth. Wipe out the same mortar to grind your toasted cumin seeds. 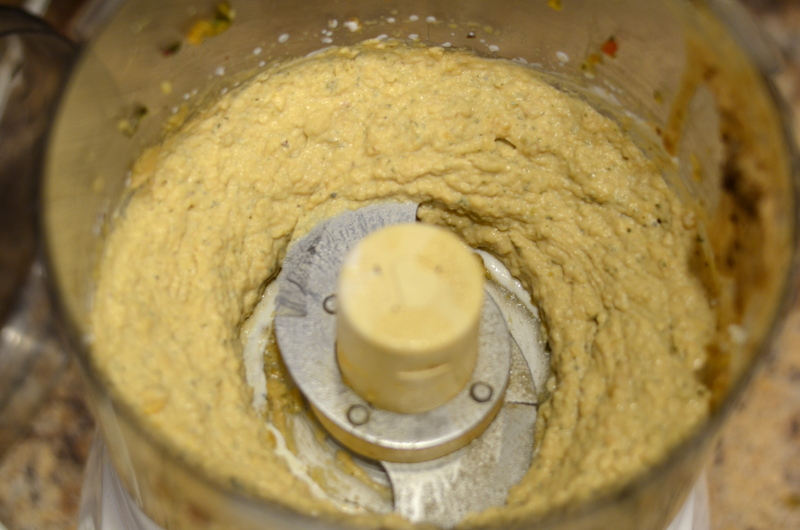 Add to processor along with tahini and yogurt and run the machine until smooth once again. With machine running, add lemon juice, olive oil and a touch of salt to taste. 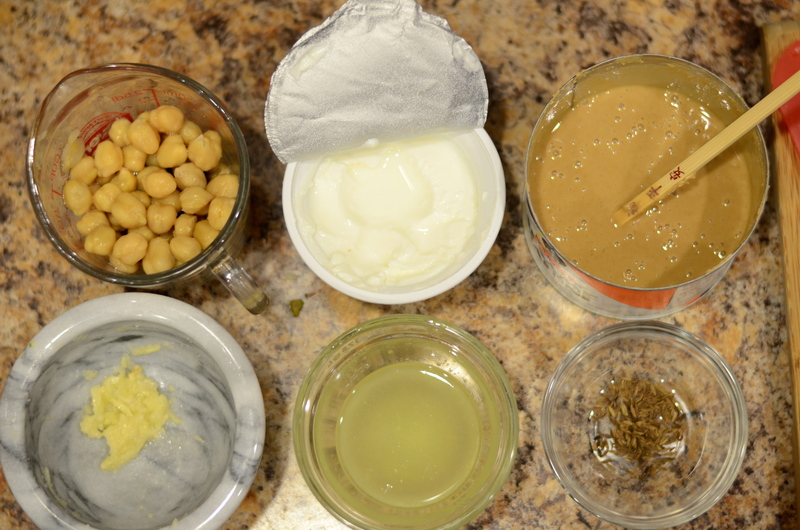 Test the dip for seasoning, and then transfer to a bowl. 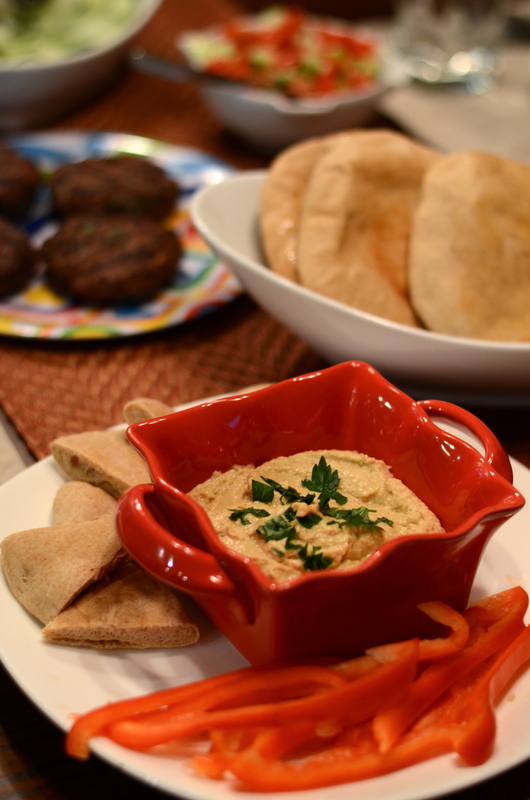 Sprinkle with chopped fresh parsley, for garnish, and serve with crudités, along with some wonderful homemade whole wheat pitas. Stay tuned for what I made with the leaves this time! This entry was posted in Entertaining, Fast and easy, Picnic-friendly, Recipes, Vegetables, Vegetarian and tagged chickpeas, greek yogurt, hummus, lemon, swiss chard, swiss chard stems, tahini. Bookmark the permalink.